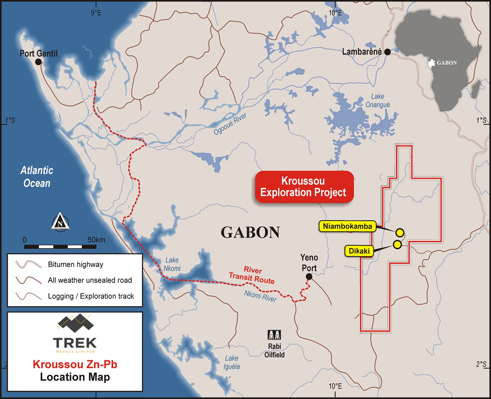 Australian exploration company Trek Metals has deployed a second drill rig on its zinc and lead project in Gabon. The company announced that about 20% of the drilling programme at Kroussou was completed by the end of the first quarter of 2018. According to the company, the two drill rigs are now drilling in tandem. Present new exploration targets — demonstrate multiple deposit potential. Observations, by Trek, during the current programme, indicate that zinc and lead mineralisation is present in all the holes drilled to date. The mineralisation is dominated by the replacement of carbonate in fine — coarse sandstones and micro‐conglomerates by trace to highly abundant, disseminated, sphalerite (zinc sulphide) and galena (lead sulphide). These observations are consistent with those from zones of mineralised core in holes completed during last year’s confirmation drilling programme.